Note: If you are primarily interested in guitar amps, look at the TUT (The Ultimate Tone) series; between TUT and TUT2, everything in POP is covered. 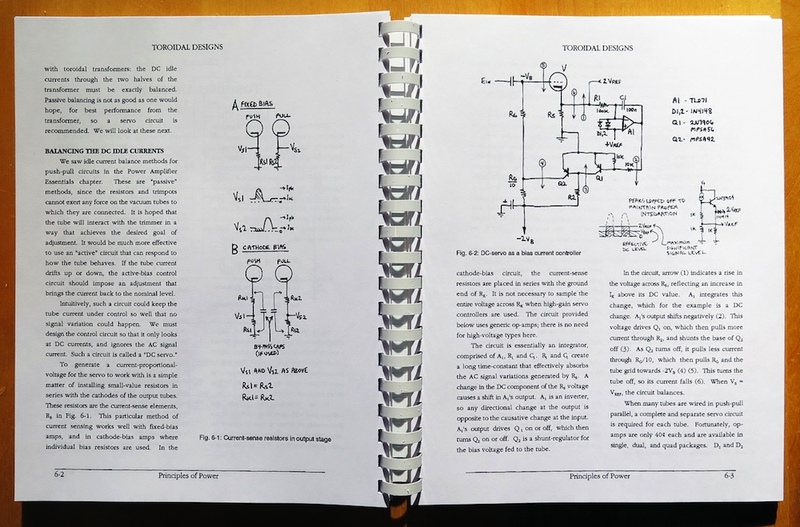 Principles of Power offers a highly simplified method of designing tube power amplifiers for audio use. The traditional graphic approaches have been synthesized into a few simple equations that allow the direct use of tabled tube data. Vacuum tube operation is clearly explained, as are circuit principles. Class-A, class-B, cathode bias and fixed bias are clearly explained. Push-pull and single-ended designs are offered, as are numerous front-end circuits. Differential, concertina, paraphase and transformer drivers and splitters are presented, with new light shed on a few "long lost" methods. Specific circuit adjustments are offered for linearizing audio reproduction amplifiers, and for maximizing power output for musical instrument use. 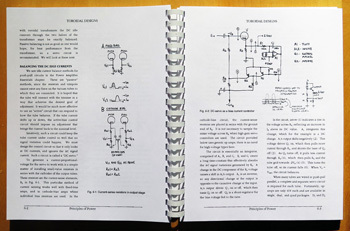 The book includes complete designs that incorporate off-the-shelf transformers and current-production vacuum tubes. Power outputs from 15 to over 400 watts are depicted, using pentodes and true triodes. Conservative designs allow reliable use of lower quality or "non-optimal" tubes. Output-transformerless (OTL) designs are studied, and up-to-date hybrid tube/solid-state circuits are explored. A complete design method is offered to accommodate any output power level. Circuits of up to 200W are presented. The use of toroidal output transformers is considered, highlighting the special precautions required. DC balancing and transformer protection are discussed with regard to all designs. Power supply design is presented, from traditional filtering to new-technology regulation methods. A discussion of the impact of the power supply on the audio signal demystifies the selection of suitable capacitors for the power supply. Appendix A covers tube data for types that are commonly used and currently available. Appendix B lists new ultra-wide-bandwidth audio output transformers from Plitron Manufacturing, as well as their matching power transformers. Appendix C provides information on the newly expanded line of Hammond transformers for tube use. Since POP was released (1996), nearly half of the power amplifier circuit contributors to Glass Audio magazine cite this work in their references.